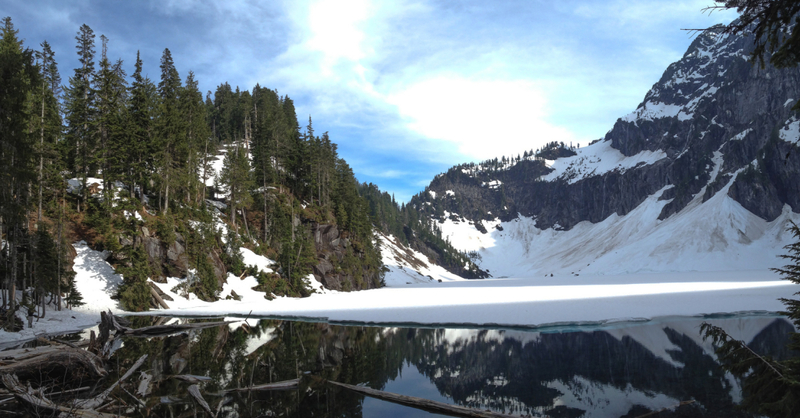 Bridal Veil Falls and Lake Serene are each pretty enough to merit this trail’s 8-mile, 2000-foot uphill slog on its own right; put the two destinations together, and you’ve got a recipe for a truly memorable day. The hike warms you up by starting on a level old road, lined with salmonberry bushes and deciduous trees. Half a mile in, the trail enters a dense forest and starts to gain some elevation. 1.7 miles from the trailhead the trail splits, with a signed trail to the right that leads to Bridal Veil Falls. Taking this trail adds an extra mile (round-trip) of stairs to the trek, but it is certainly worth the extra effort. The falls impressively pour from the east flanks of Mount Index. Climb the stairs to the boardwalk beneath the falls for an up close and personal view of the falls (natural shower included). 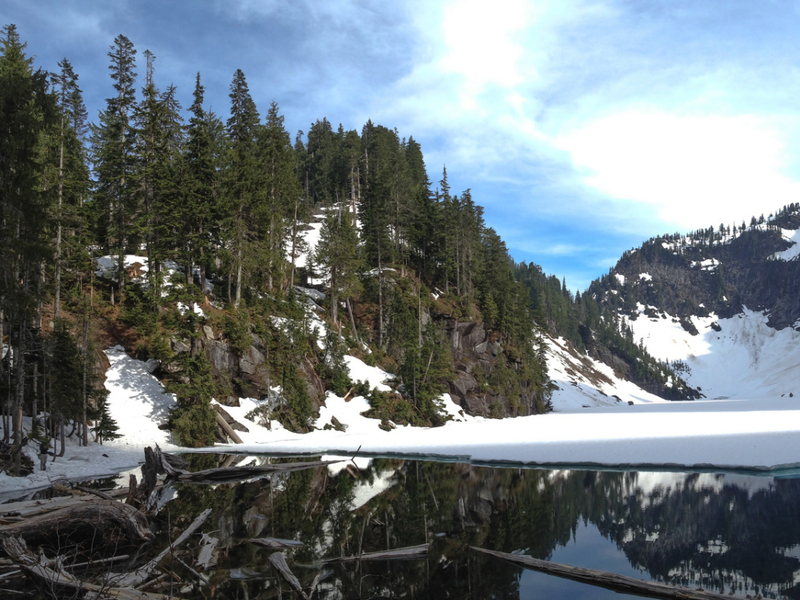 From here, some intrepid hikers may want to take the faint path alongside the mountain to Lake Serene. While going this way cuts two miles off the trip, it is much steeper and oftentimes presents route-finding difficulties when the path becomes harder to see or obstructed by fallen trees. When in doubt, stay along the creek. You will also come across another pretty waterfall tucked halfway between Bridal Veil Falls and Lake Serene. Only take this trail if you’re up for an adventure. If you’re not, you will likely feel frustrated by its tricky nature. Most people will want to continue back down the stairs to the turnoff for the falls. Once back on the main trail, cross the creek and brace yourself: this is where the real climbing begins. Over stairs and a series of 23 switchbacks, the final 1.5-miles of the hike gains 1300 feet to the rim of the lake basin. 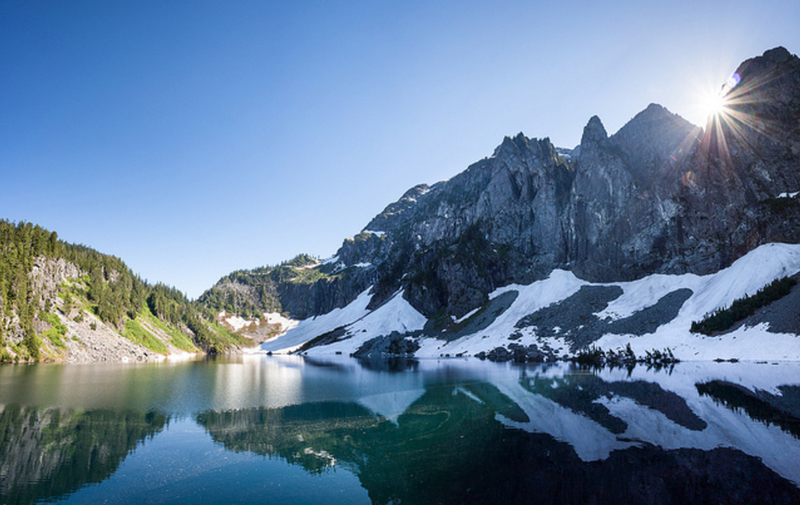 Continue down the trail to the aptly named Lake Serene’s rocky shores. You’ll want to take some time here, taking in the lake and Mt. Index’s summit looming 3000 feet above. Follow US 2 east seven miles past Gold Bar, then turn right onto Mount Index Road. Take this dirt road for about half a mile, then turn right onto the road marked Lake Serene Trail 1068. The trailhead and parking lot are 500 feet up this road. The parking lot is large but, because this is such a popular hike, on a nice weekend day it is likely to fill. Try to get there early or go on a weekday.